When the early European explorers marveled at the ocean of grasses that came up to their horses' flanks, they were talking about a landscape richly endowed with colonies of this magnificent grass. Big Bluestem grows to a height of 3 to 4 feet, and its' roots may reach a depth of up to 12 feet. Grazing animals will almost always choose this grass in preference to others; and as a result of farming and careless range management practices, it has all but disappeared from most of its original habitat. Early settlers crossing the prairie on horseback wrote of a tall prairie grass that brushed their knees. The undisputed “King of the Prairie” is Big Bluestem. 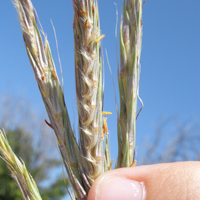 It is the tallest of the native prairie grasses, ranging in height from 2 to 10 feet. What the early settlers saw above ground was only 1/3rd of the plant. The other 2/3rd of the plant was below ground. Their fibrous root systems reach down into the earth an astonishing 10 to 12 feet. The Chippewa Indians used the roots for stomach pains and the leaves for fevers. Natural building materials were made from bundles of leaves and stems fastened to the support poles of their dwellings. This King of the Prairie along with a diversity of other native prairie grasses are vital in protecting valuable topsoil from the winds which constantly blow across this region. Some still remember experiencing the results of plowing under vast native prairie grasses in the 1930’s with the beginning of the dust bowl. Big Bluestem, Andropogon gerardii, is a perennial warm season grass that forms dense stands that gradually increase in size over time. Multiplying by seeds and tough rhizomes 1 or 2 inches below the soil, plants can over time form a very strong sod. These stands were kept in check by naturally occurring wildfires that would sweep across the prairie. After these wildfire events, Big Bluestem would regenerate from its tough rhizomes. Carbon leftover from burns was washed into the soil by rain to help feed the production of lush, healthy new growth. Big Bluestem has blue green stems that turn blue–purple as it matures. It will grow slow in the cool weather of spring with most of its growth occurring in mid-summer into fall. 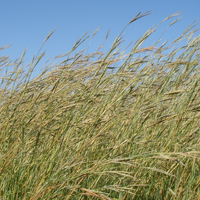 Big Bluestem is a high quality forage species that has a crude protein content of 16%-18% in the summer which decreases in late fall. 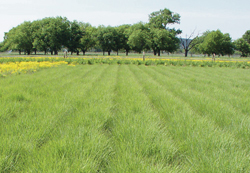 Cultivated for sustainable grazing and hay production, this grass can yield 2 to 4 tons of hay per acre without chemical pesticides or fertilizers. Another common name for Big Bluestem is Turkey Foot. The seed head is branched into three parts that looks like a turkey’s foot. These seed heads make attractive fall accents in prairie meadows. Big Bluestem seeds are often used in restoration projects from prairie restoration to highway revegetation, mine reclamation, logging restoration, pipelines, road cuts, and detention basin slopes. Its dense structure protects the disturbed soil from wind erosion and deep roots anchor the soil in place from water erosion as well. This native grass thrives in deep soils from the Gulf of Mexico to Canada and prefers full sun but will tolerate part shade. Because of its deep root structure it is highly drought tolerant and lives happily with the natural rainfall. Big Bluestem provides cover for numerous species of wildlife. The Sedge Wren and Meadowlark use it for their nesting sites, and it is a larval host for at least two butterfly species, the Delaware Skipper and the Dusted Skipper.